ames Bond is at it again – this time investigating the mid-air theft of a NASA space shuttle. Beginning with the rocket’s builder, the massive Drax Industries, Bond unweaves a conspiracy that takes him across the globe to Italy and Brazil, discovering a horrendous plot by the company’s owner, Hugo Drax, to commit global genocide and repopulate the planet in his image. Just how far is Bond willing to go to save the entire planet? Even outer space is no obstacle! Moonraker was released during a period where sci-fi films were big – Star Wars was a huge success. In an attempt to put James Bond in space, some liberties naturally had to be taken – unfortunately those liberties managed to migrate into other areas of the plot. At best Moonraker could be called James Bond’s most committed foray into comedy. But I just call it “goofy” – I mean how else could you describe a movie where a gondola converts into a hovercraft (travelling down Venice’s streets to the surprise of stunned residents – and pets), where one of Bond’s most infamous henchmen falls in love, where dozens of men in space suits have an outer space battle with laser guns, where a security door password is the tune from “Close Encounters of the Third Kind”, or where James Bond appears in a spaghetti Western scene? Sure, Bond is no stranger to implausible events, but they’re usually played a little closer to the hand. That’s not to say that Moonraker isn’t entertaining – far from it. There are even a number of amazing action scenes to feast your eyes upon, including a stunning freefall sequence at the beginning. As Bond, Moore does a rather good job holding his character together, taking the bizarre directions that the film heads in with a cool confidence. But if there’s one thing that Moonraker has taught us, it’s that James Bond should stay out of Star Wars. As with the other recent James Bond releases, Moonraker has been treated to a rather deluxe restoration process – and boy does it look good! For a 30 year old film Moonraker’s transfer is perfectly clean, with rich but realistic color and solid black levels. Grain is kept to a minimum, but what’s more impressive is the incredible level of detail that’s been extracted, with each strand of hair and thread of fabric faithfully reproduced… right down to the pores in Moore’s no longer youthful skin. There is perhaps even a little too much detail at times – in an early scene, a room with a large number of horizontal blinds exhibits a rather noticeable moiré pattern – detail bordering right at the limit of HD resolution. Moonraker has been given an AVC MPEG-4 encode, with an average bitrate of 20-22 Mbps. This data rate is practically static, rarely straying from that limited range, although I did note a few occasional peaks up at 30 Mbps. Ah, what a difference a decade or two will make. Comparing Moonraker to Goldfinger (which were both released on Blu-ray at the same time), the restoration engineers obviously had far more to work with here. The sound mix is much more active, with greater surround channel usage and a stronger and more enveloping soundstage. It also has a surprising amount of bass – although there’s essentially no subwoofer range material here, the orchestral score is suitably deep and rich and a joy to listen to. Dialogue is strong and easily understood over music and sound effects. I heard no peaking or other distortion, but there is a noticeable amount of background noise in the recording that comes and goes with each line of dialogue – something that’s not uncommon for films of this era (and even much newer). With the Bond back-catalogue being released in collections of three, I’m pleased to see that Moonraker has not been shortchanged in special features, something that can happen with a mass release. The majority of features here are offered in 1080p video, with a few using DVD-level encodes. 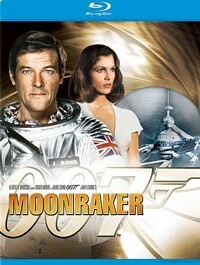 Commentaries: Two commentary tracks are included with Moonraker. The first is with Roger Moore – alone – discussing his role as James Bond in general, along with stories of the making of this movie and others from the timeframe. The second track is more technically oriented, with director Lewis Gilbert and various members of the crew. This one features occasional narration by John Cork of the Ian Fleming Foundation, and is a bit more “produced” than most group commentaries. Inside Moonraker (1080p/2.0): This 42 minute original documentary covers the concept and production of Moonraker. Although this is a new documentary and presented in high definition, all of the spoken interviews are taken from standard definition tapes that were presumably part of an earlier effort. The Men Behind the Mayhem (1080p/2.0): This new 19 minute documentary delves into the history of the James Bond franchise’s special effects and technological gadgets, but isn’t specific to Moonraker. 007 in Rio (1080p/2.0): This behind-the-scenes featurette was originally made in 1979 to promote the film. It’s rather grainy, but contains some interesting footage. Bond 79 (1080p/2.0): A short collection of interviews with cast and crew, filmed between 1976 and 1979. Ken Adam’s Production Films (480p/2.0): A collection of 8mm footage taken behind-the-scenes during the production of Moonraker. At least someone was filming the film! Learning to Freefall (480p/2.0): Footage taken during a proof-of-concept practice for the amazing skydiving sequence – and in this case practice really does make perfect! Skydive Storyboards (480p/2.0): Original storyboards for the skydiving sequence. Circus Footage (1080p/2.0): A lot of work went into a circus sequence that ended up lasting mere seconds! Cable Car Storyboards (480p/2.0): A pair of storyboard alternatives to the finished cable car sequence. Ministry of Propaganda (1080p/2.0): Just one theatrical trailer here, although it is nicely restored. Compared to the 37 promotional items provided with the Goldfinger disc, this effort feels a little lackluster. Whether you think it’s classic, comedic or just plan weird, Moonraker is undeniably entertaining with amazing action, nifty gadgets, beautiful women and an evil villain trying his hardest to destroy the planet. So sit back, plug in the Blu-ray, grab a tub of popcorn and travel into outer space with James Bond... and Jaws!